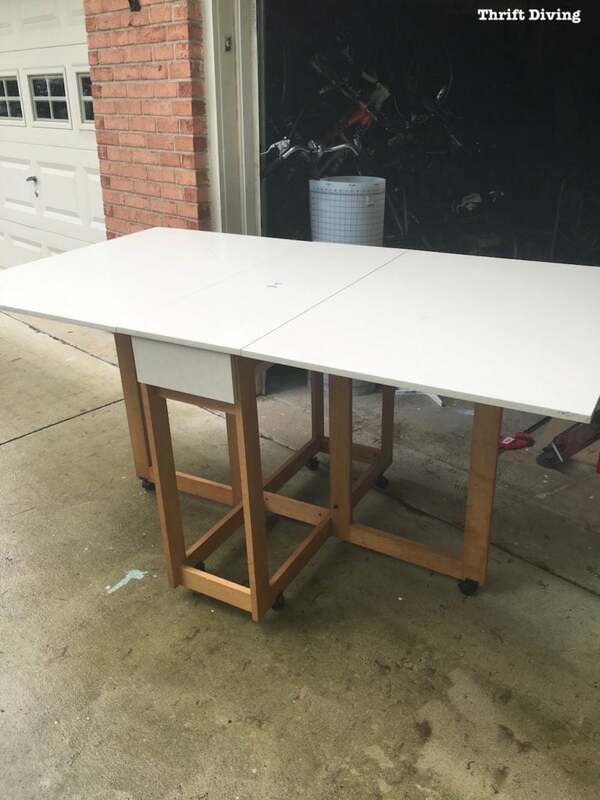 I Found a Thrifted Hobby Table for $18! 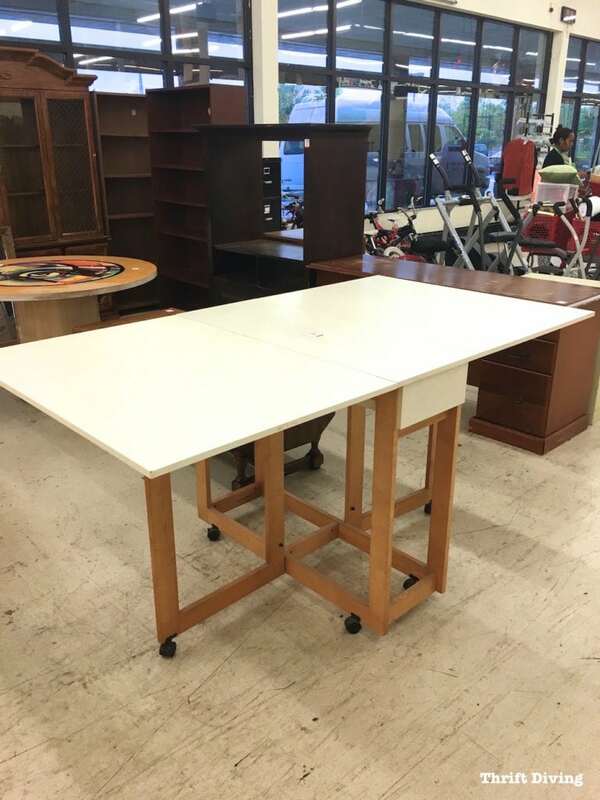 You are here: Home / Thrift Talk / Thrift Haul / I Found a Thrifted Hobby Table for $18! It’s no secret that we have the best thrift stores here in Maryland. I think the reason why is because it’s such as large metropolitan area that borders Washington, DC, and it’s so transient here. People come for years (maybe military families?? ), and then move on. And where do you think all that furniture goes from these people coming and going? Anyhow, I used to allow students to bring their own furniture to furniture painting class. And although it wasn’t a problem for most people, there was always that ooooonnnnee student who would bring in something so badly chipped that it would be falling apart…or someone would bring something old and worn with mahogany stain–and you know what mahogany stain does……bleeds through! To prevent all of those issues, I decided that instead of students bringing their furniture, I would supply all the furniture pieces. I was nervous about making this change because I thought students would mind (and some probably do), but doing this helps me to control the environment–I can pick things I know make a great project, without bleeding or being too difficult of a project. But guess what that means for me?? It means I get to hit the thrift store more often in search of projects! WOO HOO! For my recent furniture painting class here in Maryland, I stopped by my favorite thrift store right after dropping my kids off at school. But what does my eyes see?? Well, look a little closer. 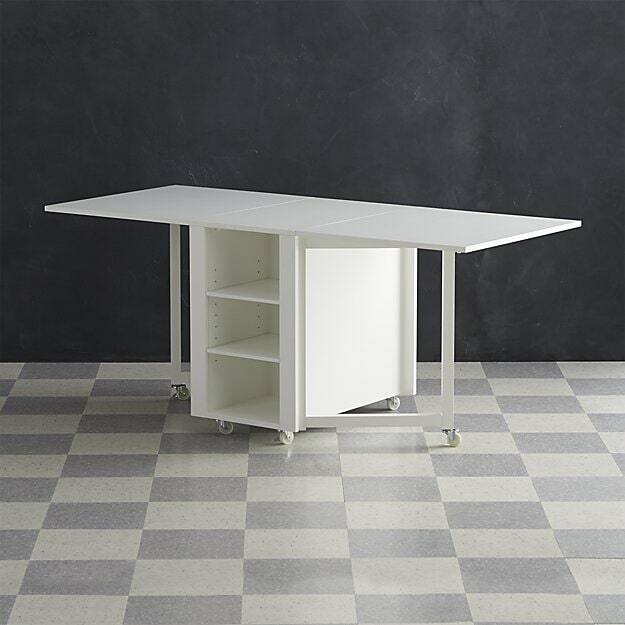 A shimmy here….a shimmy there… and you totally get this: a hobby table! Sitting right there in front of me, spread out in its glory! I hadn’t even been in the store for more than 30 seconds when it caught my eye. Damn right it is, I was thinking. What’s even better is that I had a 30% off coupon, so I got it for just over $18! 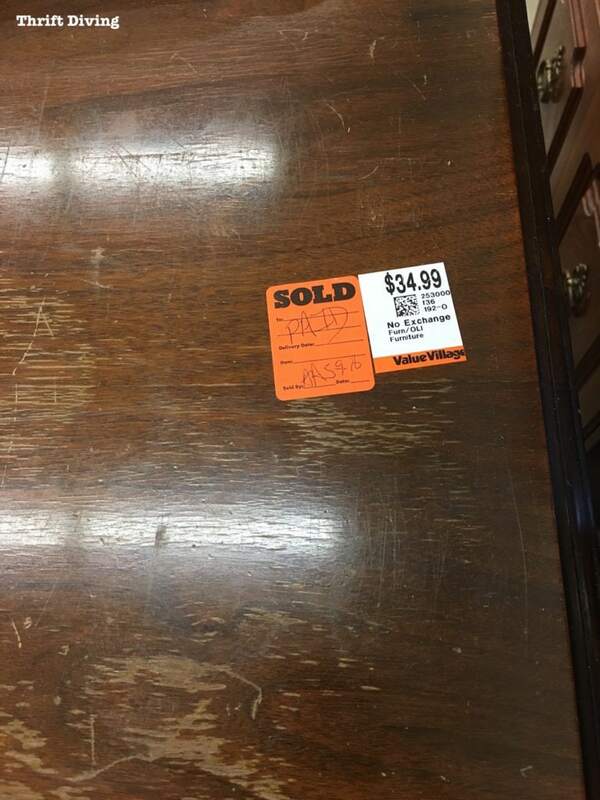 I wasn’t even going to chance it by having them put a “SOLD” sticker on it so that I could walk around the store to keep browsing. Nope. Learned my lesson there. Too many thrift store vultures lurking at my back. I swooped that baby up so fast, loaded it up in my car, and then went back into the store to keep searching for furniture painting projects. 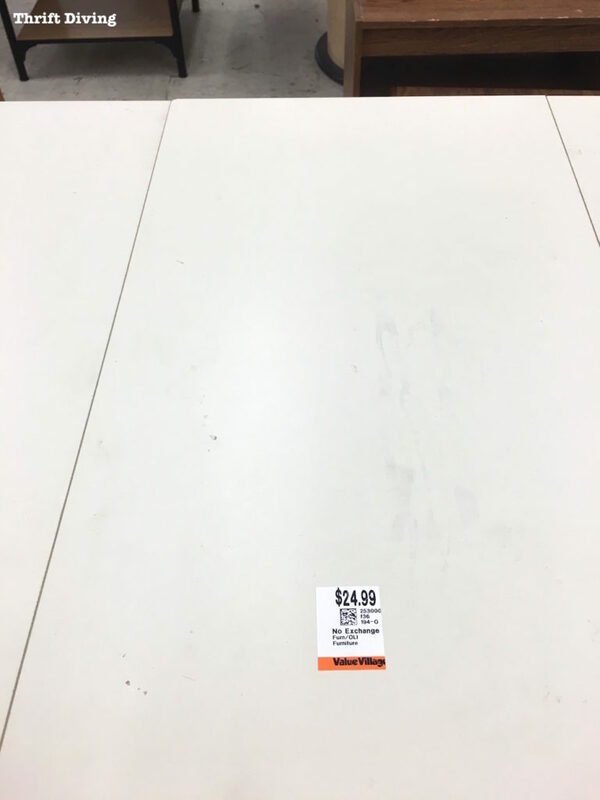 Right at the back of the store, I saw this huge 36″x72″ cutting mat sitting on top of the shelf! Just my luck! What I think happened is that this cutting mat got separated from the hobby mat. Cutting mats can be pretty expensive. (Check out my affiliate link to search for cutting mats on Amazon). I can’t even tell you how much it would have cost me brand new on Amazon, but here at the thrift store, it was $7.99, and just because I asked, I was able to get 30% off (since I had already used my coupon on the hobby desk, I thought they would say no, but they said yes. Score!). And if you read my last post about furniture painting class, I found the cute little side table at the same time. 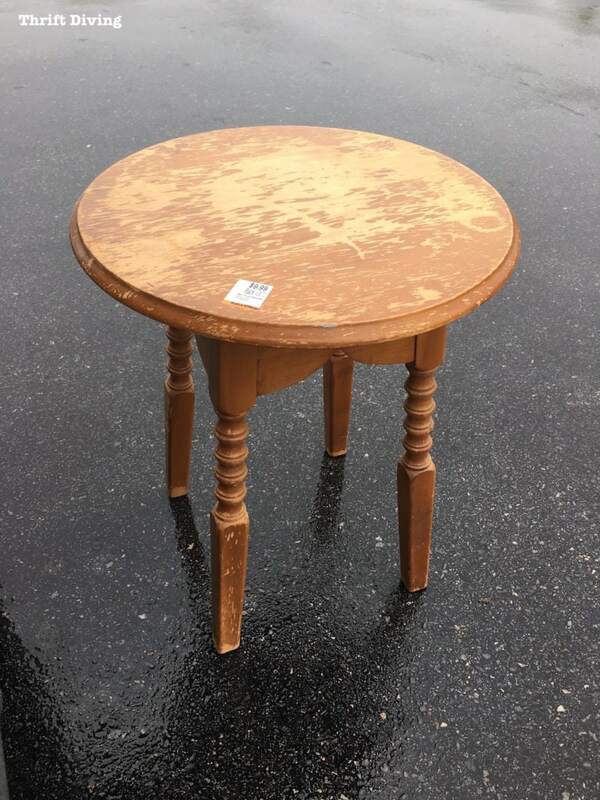 It was badly chipped, but I knew a little bit of sanding would make it amazing (click here to see the AFTER of this little table!). It’s not too often I get super excited about dressers at the thrift store anymore. 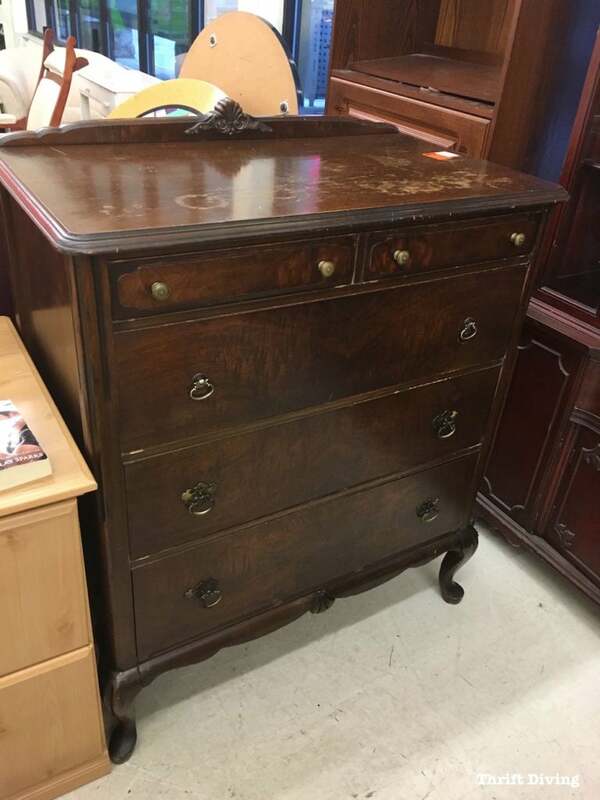 Most of them are pretty run-of-the-mill, but every now and then, something grabs my eye and makes me wish I could lug it home, even though I have absolutely no need for one more dresser in this house. But this one–ohhh…it was gorgeous. If it hadn’t been sold, I would have bought this! Sorry to disappoint, folks, but there was already a SOLD sticker on it when I saw it! It really was only $34.99!! Can you believe that?!?! And the funny thing is that normally with dark furniture like this, my first inclination is to paint it. But there was something special about this piece. Yes, it was chipped on top and could have used a good sanding and smoothing (piece of cake). But there was something so pretty about that wood grain. I’m pretty sure that if this dresser had been mine, I would have stripped and restored it. Check out how to strip and stain furniture. Of course, there are times when you shouldn’t paint wood furniture. And while this one would have passed my “should I paint it or not?” test, my gut would have told me “NO!” on this piece! What about you guys–would you paint that dresser if it were yours? I don’t think I’ve been as excited about a thrift haul lately as I was with this one. It looked all pretty packaged in the back of my minivan! Well, of course I had to go hunt down this “expensive twin” of my hobby table. And sure enough, she was right! The big difference is that their table has shelving and is enclosed. My table has a small drawer on each side, too, which is awesome. But, I’ve got power tools, you guys…..and I know how to use them. Wouldn’t take me longer than a couple hours, max, to figure out how to nail or screw some boards on the inside. A little bit of wood and–BAM!–mine, too, will have shelving. I’ve even though about the fact that I could easily build a hobby table like this from scratch and then share the tutorial with you guys! Let me work on that…. In the meantime, I’ll probably paint the whole thing white, too. That makeover will be coming very soon! I also stopped by the ReStore and saw this cool chest. 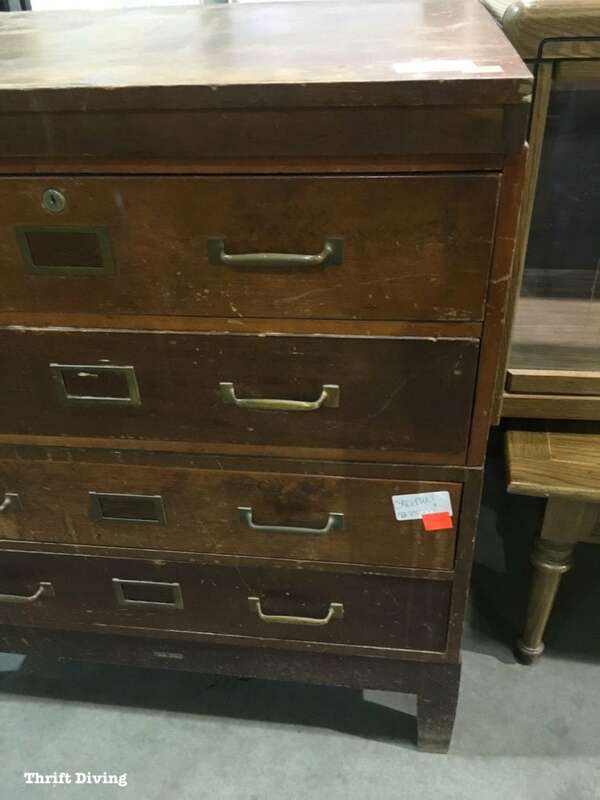 It was pretty beat up–more beat-up than what I would have taken or thought possible to really restore–but it still looked awesome with those handles and card catalog type of plates! 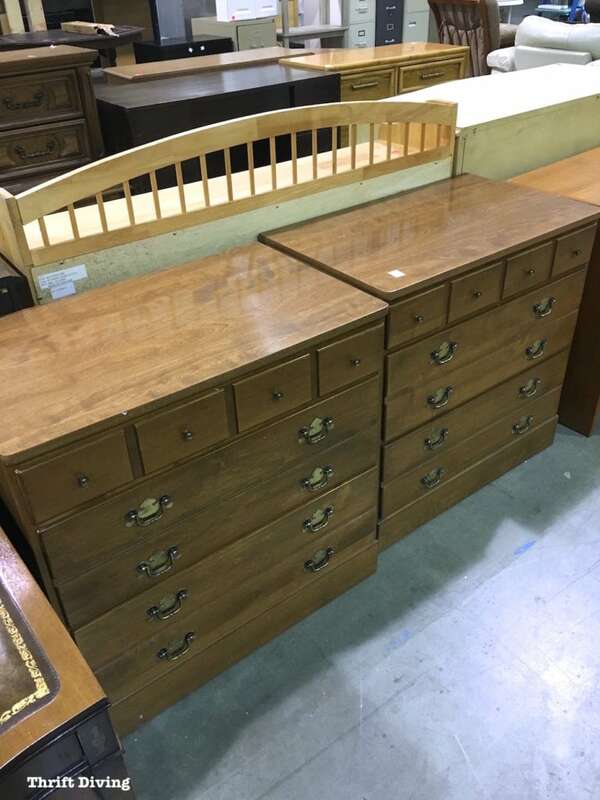 And I was >thisclose< to almost buying these Ethan Allen dressers which were pristine. Seriously the most clean thing I’ve ever seen while out thrift diving. They were $80 each, which is what stopped me. Who has $160 just sitting around?? They would have been amazing for my son’s room, which I think I’ll be tackling in June. But I think they were too tall to use for bedside tables, so I skipped them. Wise decision or not? Hmmm…I wonder if they’re still there….. So Where’s the Hobby Table Going? Well, as you know, I’ve been working on The Never Ending Garage Makeover. It’s moving slower than the pace of my 4-year-old getting dressed (and that’s pretty slow, HA!). Eventually, the goal is to strip and paint the garage floor…move out the remaining furniture that’s still in there…and add in some organization and finishing touches. This hobby table is a perfect workspace to pull out when I need a surface for doing projects. And since it folds pretty compactly, it won’t take any amount of space to store when I’m not working on something. I couldn’t have stopped by the thrift store at a better time than the morning I found my thrifted hobby table for $18. Holy Moly, again, you do have the best priced thrift stores. Like totally LOL. Great hobby table for sure. I was looking for one, just never found one and when I did, it was such in poor condition and priced so high. I said nope. So you have a great piece there. But I can’t tell you how lucky you were to find that cutting mat. And yes you are right about them being pricey. I just finally made me a sewing cutting/hobby table out of a crib changer. 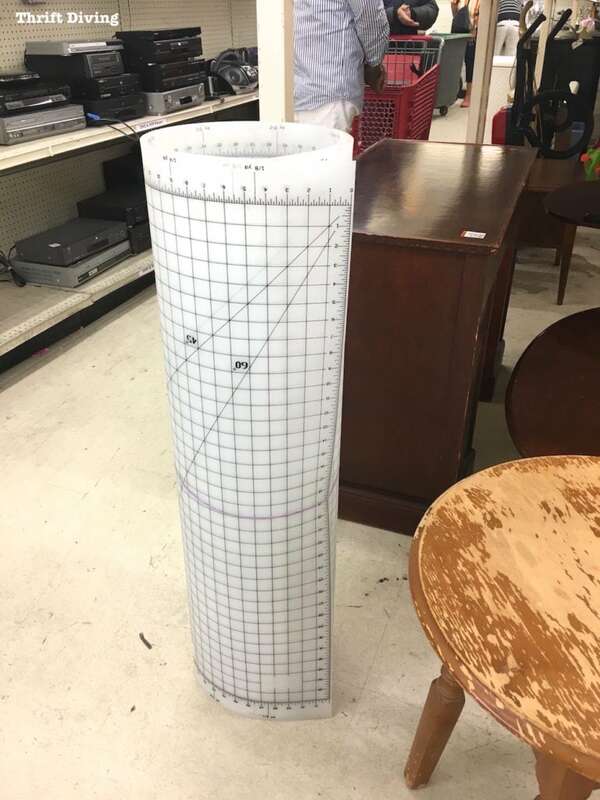 I made it to fit almost the size of a large cutting mat in hopes to find one at thrift store. So you did an awesome score. Way to go girl. So much goodness in one post! I love the hobby table. I’ve seen it on some of your snaps and never even heard of that before, but I NEEED one!!! Also loving that tiny little table. Great deal on the cutting mat. I just bought a self healing one half that size for like $30-45. You do find the great deals. Those 2 dressers would make great bed side tables. I had 2 very old dressers with mirrors that a coat of paint was their only chance of life. Took the mirrors off and painted them up and we use them as bedside tables in our master bedroom. Amazing the stuff you can keep by the bed and so handy. I am sooo jealous of your work table find! LOL Our thrift shops in my area (Brick, NJ) are usually filled with old clothes, tons of dishes and glassware and junk! A new one just opened and I’ve heard it has some very good bargains on furniture. I haven’t gotten there yet but i am going to check it out soon. It’s really awesome to have such a selection, Carole! 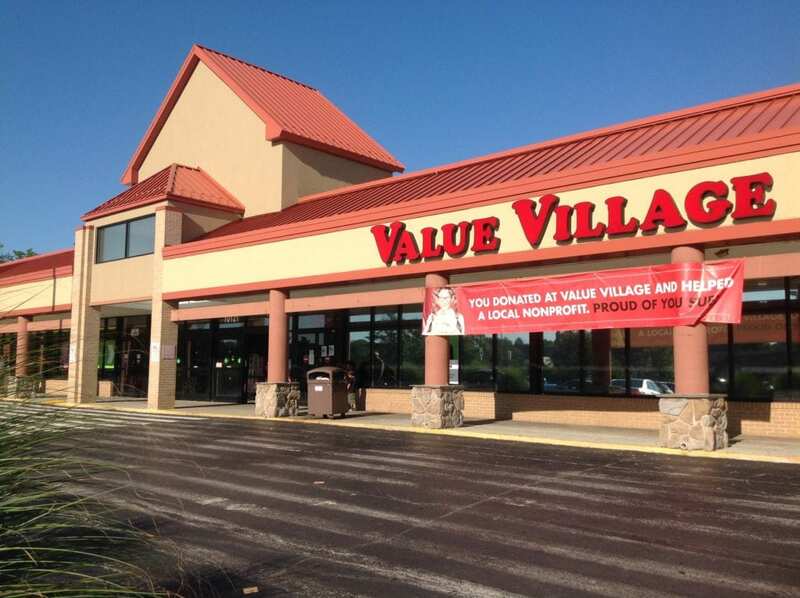 Did you get a chance to check out the new thrift store yet? My sister and I had those exact dressers! My sister still uses hers, they were purchased in the 50’s.. They had a bookcase of sorts that went on top for storage or displaying things. Michelle, on reading your query, my first thought was that your daughter should just say “my dad told me to get this”. I used to work on cars with my dad and brother. If I had the car hood up, some man would inevitably stop to help. I would wait politely while they looked things over and prayed they didn’t screw anything up. Finally I would say that I’d just have my dad look at it, wait for them to leave and fix it myself. People aren’t trying to be rude, they’re trying to be helpful. There are any number of ways your daughter can handle the situation and help these men understand that this little girl knows what she’s doing. Maybe she could offer to teach some workshops at the stores for other women to acquaint them with carpentry. Same here with flat surface problems! I have already started storing stuff on it in the garage! HAHA. It did come in handy the other day when I had to film a little video and it was large enough to spread all my stuff out for the video!! Yes! Total score on the craft table and cutting mat! You do have the BEST thrift stores in your area and I really enjoy seeing the pics. Maybe that’s “thrift drooling?” It saves money anyway. I have a cutting table very similar to that which I’ve had for many years. 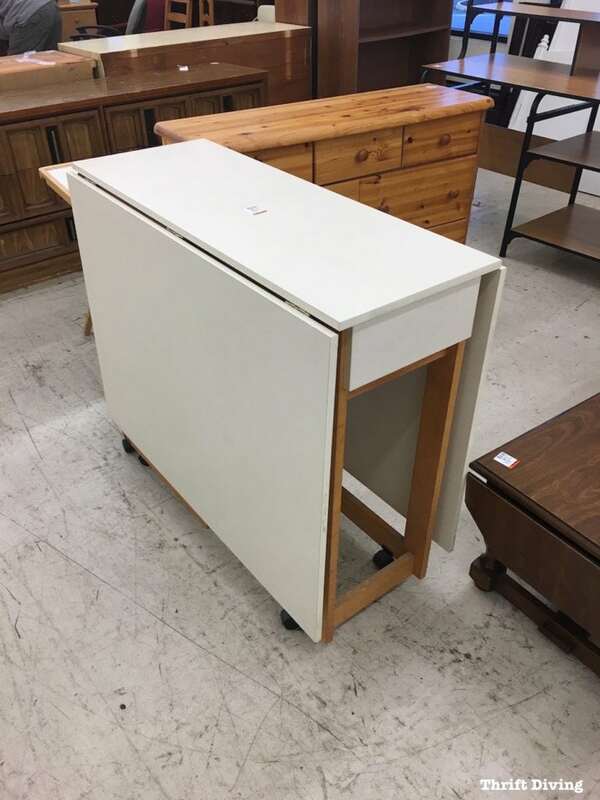 It has metal legs and no drawers, so not quite as nice or sturdy. I’ve had it so long I haven’t the least idea any more what I paid for it, but it wasn’t cheap. Cutting mats are so expensive around here that I usually put them on my Christmas Wish List if I want one. LOL And I’d have snappd up the little side table, too. It’s so cute and the finished class project was so cute in turquoise with the stenciling! Yes, yes, and yes! Wow! That is unbelievable! 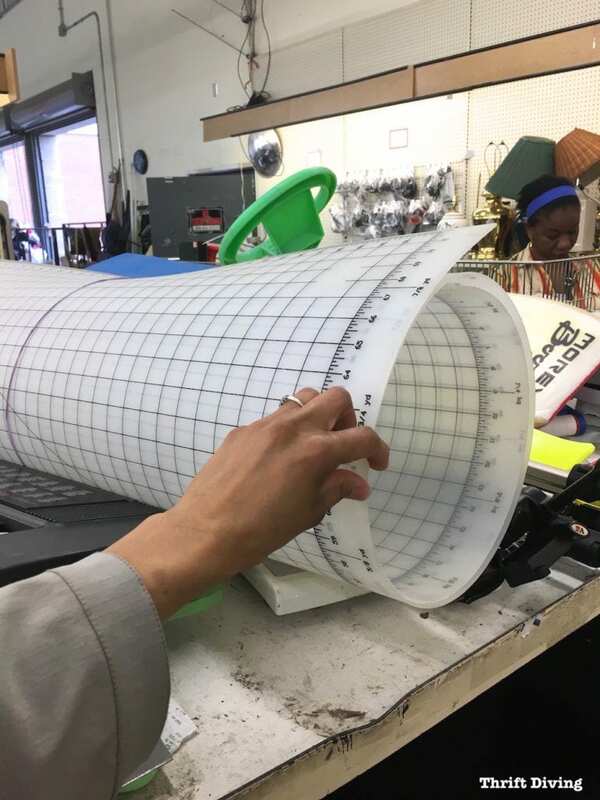 We have a regional fabric store chain that is going out of business due to bankruptcy. I was JUST at the store yesterday and those exact tables are still $259 and the cutting mat the size of yours is around $70. You got 2 big steals – congratulations! Whoa! Kelli, were they really that expensive? Sweet!! I love when I know that I found an awesome buy and saved hundreds! Woo hoo! And that table came in handy this week. The people from the Trendsetter award wanted me to put together a little video on power tools and Father’s Day and it was that table that allowed me to spread out all the stuff I needed to put the video together! 🙂 And P.S. Did you buy some awesomely cheap fabrics?! 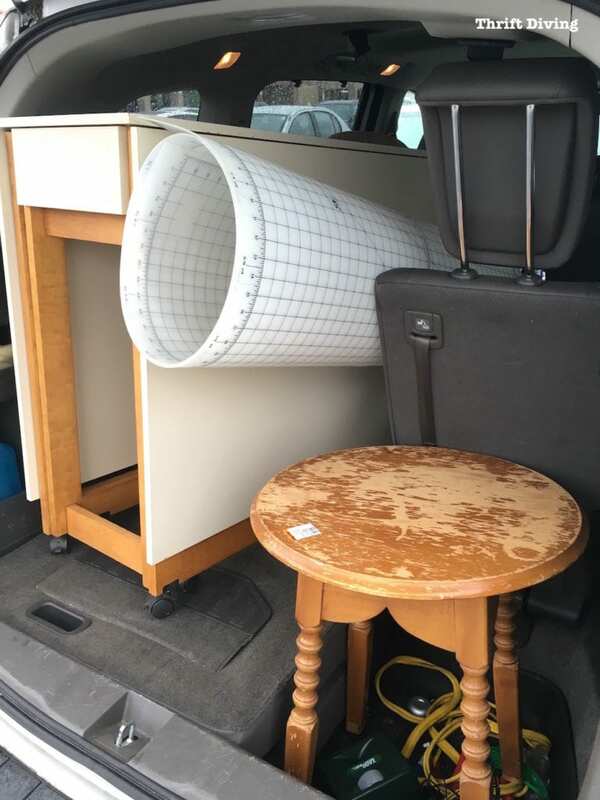 I went in again this weekend – all the cutting mats were gone but there was still a table left……..$175 so even at THAT you got a steal! You bet I got some cool fabrics. I’m making satin bound throws for everyone this year………It was all very cheap this weekend so I’m thrilled to have gotten Minnions, Dr. Who, John Deere, Star Wars and other pretty fabrics that aren’t related to any V or movies. Especially the often very expensve Minky Dot material! I also got one of those little tiny irons for $25 which was 1/2 price. Loved your Thrift Shop pictures. OK I’m not usually an envious person BUT I really envy your local shops! Here in Central Florida the shops are often filled with high priced junk. Chipped cups can cost $5.00 if they are good quality. How many of us want to pay $5.00 for one teacup with a very noticeable chip on the rim? Maybe I’m too picky but since I just buy for myself I don’t waste time with overpriced junk. Even for a mosaic artist – that chip ruined the pretty pattern especially because tea cups are small to begin with and harder to cut.. Shops used to have a wide variety of items that when new were very fine -not super designer stuff – you understand but made of solid wood not press-board with care and attention to detail. Lately all I see is dented junk. Oh, that’s ridiculous!! I think it’s because thrift stores are so “en vogue” right now. I don’t know when that shift happened, but I remember when I was little, we made FUN of people that shopped thrift stores! It meant you were poor and we used to tease each other “We caught your mother fishin’ at The Mission” (which was the name of a popular thrift store in town). Now, it’s all the rave to shop thrift when those of us that love it (and need it!) have been doing it for years. And as a result, everything’s been pushed up in price. That’s horrible! I remember when people were laughed at for Thrift shopping too! Oh were we all foolish back then. I know you think inflation is what’s changing thrift shop prices and that’s true. I was joking (honestly) when I said people changed furniture when they got a divorce. I think that so many new things are available to us these days that our ideas about the importance of things- like furniture- have really changed too. For my parents buying dining room furniture was a lifetime investment (all furniture was). It was expected to last a lifetime, and it did last; and it is still living in new finishes and shapes in new families. Some of it is even living in my house. I think many of us now expect to have more then one house, one bedroom set, one kitchen table in our lifetimes. Gosh – when my kids weren’t at home anymore and my husband died way too young, I didn’t hesitate to move to a smaller house and get different and SMALLER furniture. Nor did I hesitate to sell all my delicate antique (shaky & never valuable -OK damaged therefore CHEAP – but still pretty) furniture when I was expecting children. Well- kids are more important then furniture – why stress them or me with silly but pretty stuff! Now also there are folks who thrift shop everyday and sell things online. There were yard sale fanatics who sold stuff at their own yard sales before. The internet has made everything faster and easier to do and everyone is doing it! Well – DIY is FUN even without the profit angle! Serena, love the post. Sunday morning catch-up reading with coffee is what I’m all about. Quick question off topic but something we are struggling with here. My 23 year-old daughter Deana who is super talented and handy, owns her own set of power tools and, like you, knows how to use them is constantly being questioned or commented on when she’s out buying wood, cement, bits, bites, you name it at our local building stores. Yes, even Home Depot and Lowes. She is frustrated and fed up with the comments or the raised eyebrows, or the “are you sure that’s what you want little girl?” not just from staff but other male customers too. Without going into too much detail can you give us a little advice on how you’ve perhaps handled similar situations in the past, before someone gets clocked in the head with a 2×4? And yes, she is already writing letters to head office on how they need to step up their game when it comes to women in their stores. Hey, Michele! Wow….sorry to hear your daughter is going through that! I’ve had my share of run-ins at Home Depot but I don’t let it bother me much. When people realize I know what I’m doing, for the most part, they look at me with awe and wonder, with respect. I know–it shouldn’t surprise them that a woman knows how to do these things and feels comfortable at a hardware store. But women haven’t traditionally “fit the mold” of being capable with power tools simply because we never see it. Do you ever see a woman on a power tools commercial with sawdust flying everywhere? Nope. Maybe one day they will. But for now, being a woman with power tools is a novelty to most people and it makes sense (even though it’s wrong) for them to assume the opposite. I think what’s most important is that once people KNOW that she knows what she’s doing, to not insult her by talking to her like she doesn’t know what she’s doing. For myself, once I open my mouth and I am using terms that speak their language, then people seem to respect that. I would recommend your daughter always speak with authority and speak their language and terms, and just keep it professional and focused. That usually works for me!